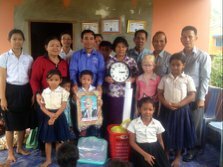 In February 2014 Radio Cracker made a donation of £7,500 to Care for Cambodia for the purpose of building classrooms in 3 CFC projects. 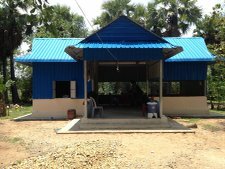 The villages chosen were Songkei in Svey Reing Province, Chur Teil in Prey Veng Province and Koh Svay in Pursat Province. In each of these villages, previously classes were held under a teacher’s house. These were cramped learning spaces that did not allow for the possibility of splitting classes according to age or ability. Each project offers supplementary education, Monday to Friday. 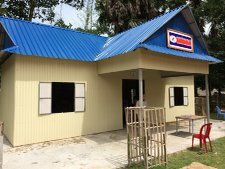 The money was received in Cambodia in early April and building work began immediately. 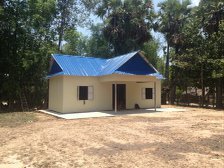 Construction took about 6 weeks to complete in Svey Reing and Prey Veng, however, in Pursat the building work was delayed a little as our provincial leader (Yee Sokun) wanted to supplement the donation with his own money to make a structure completely from brick. This required a considerable financial sacrifice of almost 500USD. This delayed the building project here for over a month. 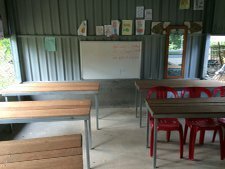 Once the building was completed, the classrooms were furnished. There were significant delays as ’shopping around’ and comparing prices between the respective provinces and Phnom Penh was a lengthy process. 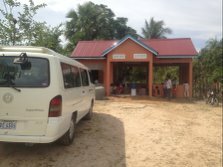 By September all buildings were completed and furnished, ready for the government school year to start again on 1 October. 1. Photo of the classroom in July when the structure was completed. 2. 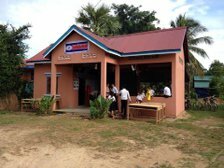 Photo taken in September when the building work was completely finished (addition of furniture, mango trees, and sign). 3. 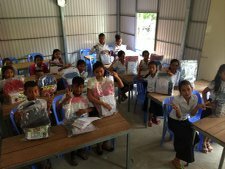 Children inside the classroom, having just received their school packs for 2014. 4. 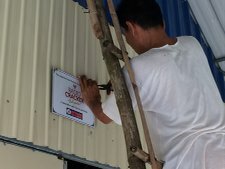 Provincial leader Keo Ratha adding the final touch to the classroom in September 2014. 1. 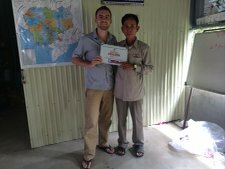 Jonny Hamill presenting CFC provincial leader, Net Ban, with the Radio Cracker sign. 2. Photo taken in September when the structure was complete but furnishing was yet to be purchased. 4. Front profile of the classroom. 1. Completed classroom in September 2014. 2. Furnishing and teaching aids being presented to local staff and children. 3. Front profile of the classroom. 4. Children in front of the new building having just received their 2014 school packs. Thank you to the Radio Cracker board, volunteers and donors for their significant investment into the lives of hundreds of both current and future CFC children.